SaaS Capital, the pioneer provider of debt financing for SaaS businesses, today announced that it has provided a $1.5 million line of credit to MBA Focus(R). Based in Columbus, OH, MBA Focus is the leading provider of advanced recruitment technology that connects leading employers with the world's top-ranked graduate business schools. For more than two decades, these school partners--and the companies that employ their students and alumni--have looked to MBA Focus for the most advanced recruiting technology solutions, best practices, and innovation. MBA Focus chose SaaS Capital as their source of growth capital after building the business with angel funding. "SaaS Capital worked hard to craft a funding model that fits our needs," commented Jack Gainer, CEO of MBA Focus. "And in the end, they brought more than money to the table--they delivered a wealth of industry experience and knowledge. This kind of partnership is incredibly valuable to growth businesses like MBA Focus." 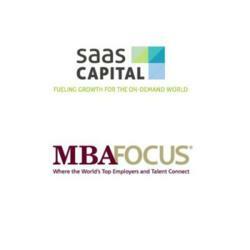 "We are excited to have MBA Focus join our portfolio of SaaS companies," said Todd Gardner, CEO of SaaS Capital. "They have a compelling product with many long-term customers who are 'raving fans' of their service. The new credit facility, which grows in size as they grow, and which they can access whenever they need it, should provide MBA Focus with growth capital for many years to come." Founded in 2006, SaaS Capital is the pioneer provider of debt-based growth capital for SaaS companies. By leveraging the predictable revenue streams and of the SaaS business model, SaaS Capital's debt facilities allow SaaS companies to accelerate future cash-flow streams to fund operations today. SaaS Capital's products provide more availability than traditional bank financing, and are structured with flexible terms to meet the needs of growing SaaS businesses. Through its partnership with DH Capital, SaaS Capital can also assist with a variety of M&A and capital raising advisory services. To learn more about SaaS Capital, visit http://www.saas-capital.com. MBA Focus is the leading provider of advanced recruitment technology--connecting leading employers with the world's top−ranked graduate business schools. With MBA Focus, corporate recruiters gain access to the world's top graduate business school students and alumni. This combination of market intelligence, technology, and access makes MBA Focus the #1 choice of companies seeking top leadership talent. For more information, visit http://www.mbafocus.com.